I never cease to be amazed by the variety of ethnic food available in San Cristobal de las Casas. On any given night you could find yourself sitting in a Spanish tapas bar, drinking Chilean wine, eating Italian food while listening to French rap music on the sound system. Other times can bring equally incongruous yet amazing experiences. One of the things I was missing in San Cristobal though was great Asian food. That was until I found the restaurant “Comida Thai”. Located just east of the andador on Real de Guadalupe this tiny rustic restaurant serves up some of the most superb Thai food I have had anywhere. All dishes are caringly prepared in the open kitchen by Sutharee, a friendly Thai expat from Bangkok. Be warned, this is not fast food. In fact, there is a “Slow Food” sign prominently displayed in the five-table dining room. 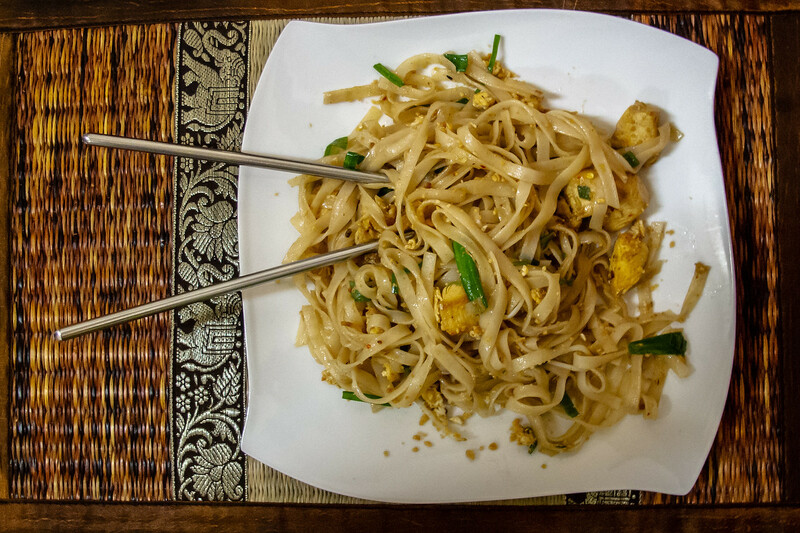 From the aromatic homemade curries, scrumptious Pad Thai and more (sometimes) this wonderful place highly succeeds but you might want to get there early. The menu is different every day and all dishes are prepared from available fresh ingredients. When they run out, they run out. On the night we went last week only two items were left from the menu and we were lucky; everyone after us had to be turned away.